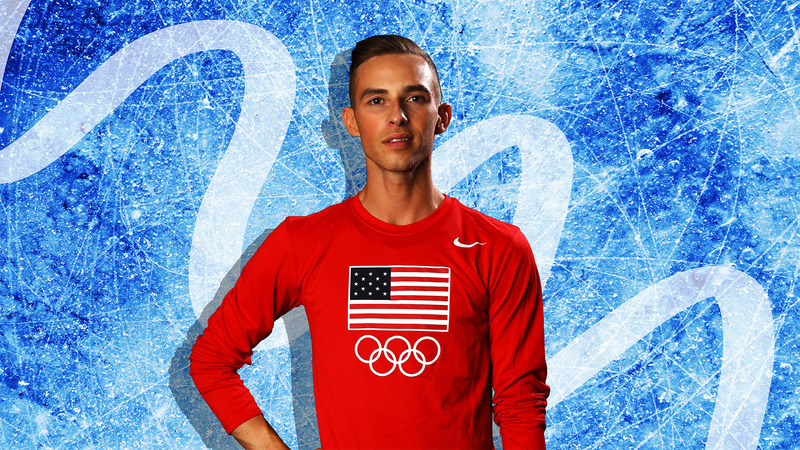 Get to know Rippon a little better before you watch him take the ice and hopefully take the gold for U.S.A.
SheKnows: What’s your earliest memory of ice-skating? Adam Rippon: I remember my mom let me stay up late and watch Tara Lipinski and Michelle Kwan compete in the 1998 Olympic Games. I made paper medals and wore them the whole night. I didn’t start skating until 2000, but I was so inspired by their skating that it was why I wanted to start. I always loved music, to dance, and to be really active. When I started skating, it was the first time all of these things came together. It felt like magic, and I always wanted to be at the rink. SK: What’s your earliest memory of watching the Olympics? AR: My earliest memory of the Olympics was watching the 1996 games in Atlanta. I remember everyone being so excited to watch. Seeing the American athletes on the podium, I saw myself. I knew that was what I wanted to do. I wanted to be one of those athletes on the podium representing their country and bringing home medals. SK: What would people be surprised to learn about training for the Olympics? AR: I think everything about my sport is cool. I would say people don’t really get to see the process of prepping for a season. There is so much excitement in getting ready for the year. You choose music, work with your choreographer and start making goals for the season. This is one of my favorite parts of the season. SK: What are some obstacles you’ve had to overcome on your road to competing in the Olympics? Did you ever think about quitting? AR: I would say my biggest obstacle was being from a small town with no sort of skating background. My mom could see I had a passion for what I was doing, so she took me to different coaches in bigger cities. Quitting, never. SK: Figure skating seems like it could be extremely competitive, like many other sports, but how do competitors support one another? AR: We just really do. For example, Nathan Chen is my biggest rival. He won the national title while I had to sit out this year. I have been training with Nathan for the past five years. I feel like he’s a little brother. I’m really proud of what he’s been able to achieve, and in practice, he pushes me to be unafraid and be better than I was the day before. SK: How does it feel to be the first openly gay man representing the U.S. in figure skating? AR: I always say… it’s just like being a straight athlete, but with better eyebrows. SK: Do you feel like too much focus is being put on your sexuality leading up to Pyeongchang? AR: It feels like an honor to be a role model. SK: Do you have any competition rituals, lucky charms or superstitions? SK: How do you motivate yourself when you’re feeling nervous or defeated? AR: Always remember why you love to be on the ice. It seems easy and simple, but the answer to this question is what will get you through the tough days. SK: What do you skate to when you’re just skating for fun? AR: Britney Spears. Beyoncé. Gaga. SK: Who are your biggest rivals, and is it friendly or contentious? AR: Nathan Chen — very friendly! SK: Where do you keep all your medals? AR: I haven’t won an Olympic medal yet, but all my other medals are in a drawer at home. I like to put them away so that I can always focus on the future. SK: What athlete is your greatest source of inspiration? AR: Michelle Kwan, Tara Lipinski, Brian Boitano, [Evgeni] Plushenko, Usain Bolt and Michael Phelps. SK: What do you want people to know about you before they watch you in Pyeongchang? AR: That I am doing what I love and that my dream has come true. To learn more, visit teamusa.org. The Winter Olympics are live beginning Feb. 8, 2018, on NBC.